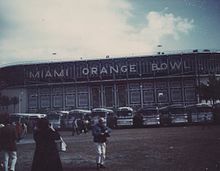 The Miami Orange Bowl was an outdoor athletic stadium in the southeastern United States, located in Miami, Florida, west of downtown in Little Havana. Considered a landmark, it was the home stadium for the Miami Hurricanes college football team, and the professional Miami Dolphins for their first 21 seasons, until the opening of Joe Robbie Stadium (now Hard Rock Stadium) in nearby Miami Gardens in 1987. The stadium was the temporary home of the FIU Golden Panthers while its FIU Stadium underwent expansion during the 2007 season. Originally known as Burdine Stadium when opened in 1937, it was renamed in 1959 for the Orange Bowl college football bowl game which was played at the venue following every season from 1938 to 1996. The event was moved to Pro Player Stadium (now Hard Rock Stadium) beginning on December 31, 1996. In January 1999, it returned to the Orange Bowl for one final time due to a scheduling conflict. The minor league Miami Marlins baseball team occasionally played games in the Orange Bowl from 1956 to 1960. The stadium was on a large block bounded by Northwest 3rd Street (south), Northwest 16th Avenue (west), Northwest 6th Street (north) and Northwest 14th Avenue (east, the open end of the stadium). The Orange Bowl was demolished in 2008 and the site is now Marlins Park, the home ballpark of the current incarnation of the Miami Marlins (formerly the Florida Marlins), which opened in 2012. The stadium was built by the City of Miami Public Works Department. Construction began in 1936 and was completed in December 1937 and featured stadium lights. Prior to completion, the first game was a high school contest on September 24 which saw Edison shut out Ponce de Leon, 36–0 with new lights partially going out, leaving mid-field dark with five minutes remaining in the fourth quarter. The stadium opened for Miami Hurricanes football on December 10, 1937. From 1926 to 1937 the University of Miami played in a stadium near Tamiami Park and also at Moore Park until the Orange Bowl was built. The Orange Bowl was originally named Burdine Stadium after Roddy Burdine, one of Miami's pioneers and the owner of the Burdines department store chain. It originally seated 23,739 people along the sidelines—roughly corresponding to the lower level of the sideline seats in the stadium's final configuration. Attendance for its first Orange Bowl in January 1938 was under 19,000, but the following year saw over 32,000 in attendance. Seating was added in the end zones in the 1940s, and by the end of the 1950s the stadium was double-decked on the sidelines. In 1966, the AFL expansion Miami Dolphins played their first-ever regular season game in the stadium on September 2. The west end zone upper deck section was then added in the 1960s, bringing the stadium to its peak capacity of 80,010. On January 1, 1965, the Orange Bowl was the first college bowl game to be televised in prime time. From 1966 to 1968, and again in the 1970s, a live dolphin was situated in a water tank in the open (east) end of the Orange Bowl. He would jump in the tank to celebrate touchdowns and field goals. The tank that was set up in the 1970s was manufactured by Evan Bush and maintained during the games by Evan Bush and Dene Whitaker. Flipper was removed from the Orange Bowl after 1968 to save costs and the 1970s due to stress. In the film Ace Ventura: Pet Detective, Snowflake, a live dolphin who does special behaviors after the Dolphins score a touchdown, was the basis of the film after he is kidnapped as part of a revenge plot against Dan Marino. In 1977, the permanent seats in the east end zone were removed, and further upgrades brought the stadium to its final capacity and design. The city skyline was visible to the east through the open end, over the modern scoreboard and palm trees. The surface was natural grass, except for six seasons in the 1970s. Poly-Turf, an artificial turf similar to AstroTurf, was installed for the 1970 football season. It was removed and replaced with a type of natural grass known as "Prescription Athletic Turf" after Super Bowl X in January 1976. Under the leadership of Hall of Fame head coach Don Shula, the Miami Dolphins enjoyed a winning record in the Orange Bowl against rival teams in the AFC Eastern Division. Under Shula, the Dolphins were an impressive 57–9–1 (60–10–1 including playoff contests) against the Baltimore/Indianapolis Colts (15–3), the Boston/New England Patriots (15–1), the Buffalo Bills (16–1) and the New York Jets (13–4–1). They have also beaten every visiting franchise at least once, enjoying perfect records against 11 of them. The playoff results against AFC East opponents are: AFC Championship games: (1971, Miami 21, Baltimore 0); (1982, Miami 14, New York Jets 0) and (1985, New England 31, Miami 14) and AFC First round game (1982 strike shortened season, Miami 28, New England 13). Notable winning streaks during the Shula-era in the Orange Bowl include a 13–0 streak against the Buffalo Bills and a 15–0 streak against the New England Patriots, Also of note, the Miami Dolphins enjoyed a record 31-game home winning streak from 1971–75, which includes four playoff wins and the perfect season of 1972. The Dolphins have not enjoyed the same level of success at Hard Rock Stadium. While much of this lack of success at Hard Rock Stadium is obviously attributable to a diminished level of talent and organizational stability, it is also widely recognized that the homefield advantage that the Dolphins enjoyed in the Orange Bowl was exponentially greater than in their newer home. This was in great part due to the atmosphere of the Bowl. The closeness of the seats to the field, along with the closed West End Zone, metal bleachers, and steel structure (and of course the team's success and its status as Miami's only professional sports team for so many years), gave the venue one of the loudest and most electric homefield environments in the NFL. Visiting team quarterbacks often complained to referees or were forced to call time out as their teammates could not hear them barking out the signals due to the unbearable noise, especially when the Dolphins were making a goal-line stand in the closed West End Zone. While Hard Rock Stadium is much newer and cleaner and is considered one of the top facilities in the NFL, with top-notch amenities, the seats are much farther from the field, and even at its loudest, Hard Rock Stadium doesn't come close to comparing to that of the Orange Bowl. The Orange Bowl was also the site of the NCAA's longest college football home field winning streak. Between 1985 and 1994, the Miami Hurricanes won 58 straight home games at the Bowl, until ended by the Washington Huskies. The stadium's home field advantage used to include a steel structure that fans would set to rumbling by stomping their feet. Concrete reinforcement had silenced the rumble. There was still the advantage of the West End Zone, which had a relatively narrow radius that amplified fan noise. The West End Zone was a factor in the Wide Right curse, in which the Florida State Seminoles lost a series of close games due to missed field goals. This section was so raucous that some football announcers often confused it with the student section. In addition to football, the stadium also hosted concerts and other public events. The stadium had a regular capacity of 74,476 orange seats, and could seat up to 82,000 for concerts and other events where additional seating would have been placed on the playing field. The last professional football game to be played in the Orange Bowl took place on April 29, 2000 and matched the Miami Tropics against the San Antonio Matadors of the short-lived Spring Football League. The Matadors won 16–13. The City of Miami embarked on a plan to extensively renovate the stadium. However, those plans fell by the wayside as Miami focused on keeping the Florida Marlins in town, forcing the Hurricanes to threaten a move to Dolphin Stadium (now Hard Rock Stadium) in suburban Miami Gardens if a plan to renovate the stadium were not in place within 45 days. Some feared that Miami would permit the college to leave, only to tear down the Orange Bowl and replace it with the new stadium for the Marlins. That fear became reality as Paul Dee, Athletic Director for the University of Miami, announced that the Hurricanes would be moving to Dolphin Stadium for the 2008 season. Dee and university president Donna Shalala made the announcement during a press conference at the Hecht Athletic Center on August 21, 2007. The University agreed to a 25-year contract to play at then Dolphin Stadium. According to Miami City Manager Pete Hernandez, this put the Orange Bowl back in the forefront as a possible site for a new Marlins stadium. The hope that talks would resume soon on that possibility vanished after only a short while. Many Hurricane fans vocally opposed the decision to move stadium locations and preferred maintaining the Orange Bowl as the Hurricanes' home field, out of concern of Dolphin Stadium's extra distance from campus, the severing of an icon of the Hurricanes' historical successes on the field, and potentially more expensive parking costs. Many fans have even stated to various broadcast, print and internet-based media outlets that they will no longer attend the games of Hurricanes football, once the team abandoned the Orange Bowl. Some speculate that the decision to leave the Orange Bowl might have cursed the Miami Hurricanes and would cite the Miami Dolphins as a precedent. Indeed, a common explanation for the Miami Hurricanes' poor performance during the 2007 season is that "they've never been the same since they left the Orange Bowl." The University of Miami lost their final Orange Bowl game to the University of Virginia, 48–0, in front of a live ESPN audience. This was the most lopsided home shutout loss in the program's history, until Clemson beat Miami 58-0 in 2015. The last home game of college football in the Orange Bowl was a home win for the Florida International University Golden Panthers against the North Texas Mean Green. FIU had been using the Orange Bowl as home field for the season due to renovations to their home stadium. UM and FIU had engaged in a bench clearing brawl at the Orange Bowl the previous year during the first of two scheduled games between the two schools. On February 8, 1997, the Miami Orange Bowl was host to a U.S. Hot Rod Monster Jam. As part of the show, motorcycle stunt rider, Corey Scott, attempted a stunt that required him to drive up a ramp and land into a net hoisted into the air. Scott missed the net, bounced out, and fell 70 feet (21 m) to the ground below. He later died at Jackson Memorial Hospital and his fatality was witnessed by a crowd of around 30,000 spectators. In 2005, Hurricane Wilma caused structural damage to the stadium, which rekindled discussion of tearing down the aging facility. The damage was subsequently repaired after the 2005 college football season. The stadium served as a FEMA relief center in the aftermath of the hurricane. The Orange Bowl was demolished in May 2008, and Marlins Park is now on the site. Despite some protests, the historic stadium had been earmarked for demolition when the University of Miami announced that they were moving out of the Orange Bowl after the 2007 season to begin play at Sun Life Stadium in 2008 in a 25-year deal. On November 10, 2007, the University of Miami Hurricanes lost their final game at the Orange Bowl when the Virginia Cavaliers defeated Miami 48–0 in the Hurricanes' second worst home shutout loss in school history. The FIU Golden Panthers (now Panthers) won their last game at the Orange Bowl against the North Texas Mean Green on December 1, 2007 by a score of 38–19, snapping a 23-game losing streak that many attributed to the consequences of suspensions following the UM-FIU brawl the year before. Since the Golden Panthers had been using the Orange Bowl as their home field during the construction of FIU Stadium, this win allowed the FIU team to boast that it was they who officially closed the Orange Bowl's college football career with a home win. A high school all-star game, "The Offense-Defense All-American Bowl", took place on January 4, 2008 and was the last game before the closing events. On Saturday, January 26, 2008 a "Farewell to the Orange Bowl Stadium" flag football game was held. The game featured former Dolphin and Hall of Fame quarterback Dan Marino, plus Mark Duper, Mercury Morris, Dwight Stephenson, A. J. Duhe, Don Strock, Jim Kiick, John Offerdahl, Jim Kelly, Bernie Kosar, Melvin Bratton, Brian Blades, Bennie Blades and Eddie Brown. The NFL's winningest coach Don Shula coached the Dolphin players while Florida Atlantic University and former Hurricanes coach (and former Dolphins assistant) Howard Schnellenberger coached the UM players. The Orange Bowl was open to the public for the last time February 8–10, 2008 when a public auction of stadium artifacts and memorabilia was held. The stadium was stripped and pieces were sold by a company called Mounted Memories. Demolition of the Orange Bowl began on March 3, 2008, and was completed on May 14, 2008. The Orange Bowl is one of seven stadiums that had hosted a Super Bowl that are no longer standing, along with Tulane Stadium (hosted three Super Bowls; demolished in 1980), Tampa Stadium (hosted two Super Bowls; demolished in 1999), Stanford Stadium (hosted one Super Bowl; demolished and redeveloped in 2006), the Hubert H. Humphrey Metrodome (hosted one Super Bowl; demolished in 2014), the Georgia Dome (hosted two Super Bowls; demolished in 2017), and the Pontiac Silverdome (hosted one Super Bowl; demolished in 2017). As part of the new Marlins Park, Miami-Dade County Art in Public Places have commissioned Daniel Arsham/Snarkitecture to design a public artwork to commemorate the Miami Orange Bowl. Their project uses the letters from the original "Miami Orange Bowl" sign as the basis for the 10-foot-tall (3.0 m) orange concrete letters rearranged across the east plaza of the new ballpark so that they form new words as visitors move around them. Miami Marlins – An estimated 57,000 fans watched 50-year-old Satchel Paige pitch there for the Marlins on Aug. 7, 1956. On that occasion, the diamond was tucked into the southeast corner of the stadium, with a high temporary fence in front of the right field seating area. The minor league Marlins played occasional other games there between 1956–60. 1990 Caribbean Series – The 20th edition of the second stage of the Caribbean Series was held at the Orange Bowl, which had not hosted baseball in decades. Many considered the series a botched experiment, especially since the stadium, by 1990, was ill-suited for baseball. Only about 50,000 fans attended during the seven-day Series, which featured teams from the Dominican Republic, Venezuela, Mexico, and Puerto Rico. The Leones del Escogido of the Dominican League won the title, led by manager Felipe Rojas Alou and series MVP Gerónimo Berroa. From 1940–65, the University of Miami baseball team played their games at a field in the southwest corner of the block where the stadium sat. The diamond and a small covered seating were in that corner, with the center field fence running along the periphery of the football stadium's outer concourse, and the right field fence bordering a driveway leading up the big stadium. There was also a softball field to the east across the driveway—during football season, the baseball and softball fields were both used for parking. The Hurricanes opened a new ballpark in 1973, and Miami Field's small seating area was demolished, with the land occupied by the two fields reconfigured into full-time parking areas. The United States men's national soccer team played 19 international matches from 1984 to 2004. The team has a 2–10–7 record at the venue, the worst record in all stadiums in the country. USL-1 Team Miami FC played 2 games in 2007 at the Orange Bowl. 1996 Summer Olympics football preliminaries. The stadium was used by the Haiti national team for their "home" matches, due to violent flare-ups in Haiti resulting from political instability. World Championships of Senior Citizen Dancing. 1984. Drum Corps International World Championships August 1983. The Jacksons – Victory Tour – November 2–3, 1984, 66.000 attendance. The Orange Bowl was a central location in the 1977 film Black Sunday. A significant portion of the filming was done during Super Bowl X on January 18, 1976. A significant portion of the 1999 movie Any Given Sunday was filmed at the Orange Bowl. Two episodes of Spike TV's Pros vs. Joes third season series were filmed here. Those episodes were the South Regional playoffs. Much of the on-field scenes for the 1994 comedy Ace Ventura: Pet Detective were filmed at the Orange Bowl. The stadium's role during the Mariel boatlift in 1980 is featured in the 1995 film The Perez Family. A scene from the 1980 film sequel Smokey and the Bandit II was shot on the field at the Orange Bowl, and included cameo appearances by Terry Bradshaw and "Mean" Joe Greene of the Pittsburgh Steelers. In the video game Driv3r, Tanner, the main character, can enter into the ground and the stands of the Miami Orange Bowl, where he finds an enemy to be dealt with. A few scenes from Miami Vice were shot there in 1988 (Indian Wars) and 1989 (Hard Knocks). The Orange Bowl was a location in the 1977 film Crime Busters with Bud Spencer and Terence Hill. The Orange Bowl was a location in the 1980 film Super Fuzz with Ernest Borgnine and Terence Hill. The Orange Bowl served as the home of the fictional Miami Sharks in the 1999 Oliver Stone film Any Given Sunday, with several football scenes being filmed there. ^ a b c d e f g h i j k "Orange Bowl". Football.ballparks.com. Retrieved October 17, 2011. ^ Information please almanac, atlas ... – Dan Golenpaul Associates – Google Books. Google Books. February 28, 2007. Retrieved October 17, 2011. ^ "Officials, captains, in first game at Roddey Burdine Stadium". Miami News. (photo). September 25, 1937. p. 6. ^ "18,000 see Auburn win Orange Bowl". Miami News. January 2, 1938. p. 1A. ^ "Auburn rushes Michigan State". Spokesman-Review. Spokane, Washington. Associated Press. January 2, 1938. p. 2-sports. ^ "Vols Swamp Oklahoma In 17–0 Battle". Pittsburgh Post-Gazette. Associated Press. January 3, 1939. p. 12. ^ "32,191 fans see Tennessee beat Oklahoma, 17-0". Miami News. January 3, 1939. p. 1B. ^ "Camera snaps color, pageantry of Miami's annual Orange Bowl grid classic". Miami News. (photo). January 3, 1939. p. 1. ^ "1965 Orange Bowl, Texas vs. Alabama: College Football Goes Primetime | Barking Carnival". Webcache.googleusercontent.com. Retrieved October 17, 2011. ^ "Miami Dolphins Franchise Encyclopedia". pro-football-reference.com. Retrieved 2007-12-30. ^ "Motorcyclist Dies At Show". Sun-Sentinel. Miami, Florida. February 9, 1997. ^ Future of Orange Bowl in doubt, BBC Sport, August 21, 2007. ^ "SI.com – News and Scores from Sports Illustrated". CNN. ^ Pope, Edwin (November 10, 2007). "Orange Bowl Commemorative Section". MiamiHerald.com. Retrieved October 17, 2011. ^ Janie Campbell. "Ballpark's Public Tribute to Daytona Beach Approved". NBC Universal, Inc. Retrieved 2009-12-21. ^ 1996 Summer Olympics official report. Volume 1. p. 543. ^ "BoxRec Boxing Records". Boxrec.com. Retrieved October 17, 2011. ^ "Concerts". Home.earthlink.net. Archived from the original on June 4, 2011. Retrieved October 17, 2011.